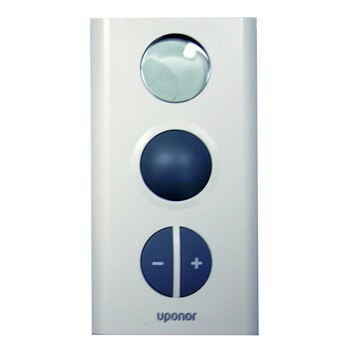 The Uponor Radio T-75 24V Display Thermostat is designed as a wireless single room temperature sensor. It measures and displays the perceived room temperature via an LCD display and transmits to the Uponor C56 wireless wiring centre. This helps to give you a visual guide as to the temperature in any given room. Get the colour that fits to your homes decor. All three colours offer you a modern and contemporary look and feel. If you want to keep the Uponor Radio T-75 display thermostat mobile buy the thermostat mounting kit for use as table holder.